Primeval rainforests bedecked with clouds, noisy, chattering birds flash brilliant iridescent colors as they dart about their daily chores, flowering epiphytes bloom en masse high above the forest floor while gurgling streams glisten and tumble hurriedly over great boulders in their dance towards the sea. This enchanted land is the Chiriqui Highlands, the part of the Cordillera Central that defines the northern border of the province of Chiriqui. It is a beautiful landscape of cloudforests, volcanic peaks, coffee plantations and home to most of Panama's Guaymi Indians. Topographically, the Cordillera Central spreads from Costa Rica through the western portion of Panama like a jagged spine that separates the northern provinces from those of the south. It is on the lower southern slopes and plains that Panama's population is concentrated and along which runs the Pan American Highway. In the province of Chiriqui, a few roads link the highway to the highland areas and only one extends through the mountains to the northern coastal town of Chiriqui Grande. All of these roads comprise the most scenic to be found in Panama. Lowland areas give way to gentle rolling hills that have been cleared for agriculture and pastureland. Climbing further, mountains become steeper, their slopes more densely forested and by noontime, they are enveloped in clouds that change their color from verdant green to misty blue. La Amistad is a binational park that stretches from Costa Rica into Panama, a small portion of which extends into the Chiriqui province encompassing mostly cloudforests. Here, the land rises in excess of 1500m and warm air ascends the mountains where it meets with cooler air and condenses into a persistent cloud cover. Cloudforests exhibit a unique ecosystem with an astonishing diversity of flora and fauna. Towering trees reach towards the sun to form a canopy that creates a cool, shadowed, misty underworld on the forest floor. One half expects to find Merlin sitting on a log around the next bend. It is noisy with the sounds of numerous insects, birds, and frogs but it is difficult to see them because of the ferns, tree ferns and epiphytes that crowd the lower and middle strata of the forest. Water drips from spongy mosses that cover tree trunks, from bromeliads that attach themselves to every cranny on the trees, and from flower petals perched high in the canopy of the forest. It is a magical world that tells of its ancient wisdom in a whisper to the heart. The usual access to La Amistad International Park is at the Cerro Punta guard station. However, park attendants are not always available and a more pleasant option is further up the road at Guadalupe. You will know that you have reached Guadalupe when you see the flowers. 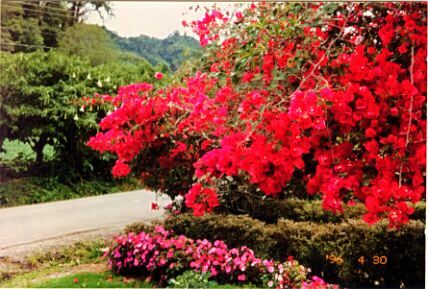 Beds of white lilies, massed blue agapanthus, rows of fragrant roses, drifts of impatiens and a dazzling array of annuals bring color and vibrancy to this tiny mountain village at the end of the La Concepcion-Cerro Punta road. Panamanians from the lowlands come to buy flowers on the weekends and birds of paradise are grown for export to Europe in the rows of hot houses along the road past Cerro Punta. Cattle and horses graze in the verdant fields of the lower valleys while vegetables are grown on the slopes. The only blemish to this captivating landscape is the use of white PVC pipes for irrigation. They run up and down the sides of the mountain between the rows of lettuce, broccoli, potatoes, onions and green peppers. From Guadalupe, it is a one hour hike into La Amistad through the private property of Los Quetzales. Along the roads that penetrate into the Chiriqui Highlands, there are lookouts where the mountains unfold to reveal spectacular views of Volcan Baru, Panama's highest peak, (3,475m). It rises massively and proudly to dominate the landscape and its summit is usually covered by clouds. The fertile, lower slopes are heavily cultivated with coffee and other mixed agriculture as well as some pastureland. Patches of forest remain but the forest line has been pushed upwards such that primary cloudforest is only found above 2000m. Birdlife is abundant and the area represents the southern boundary of the quetzals' habitat. Sub-alpine scrubland and elfin forests characterize the upper slopes where continuous cloud cover and cool temperatures contribute to the low stature of the forest canopy. The easiest way to reach the peak is simply to drive up from Boquete in a 4WD vehicle. This can be rented in David or you can hire a driver and vehicle in Boquete or Cerro Punta. Hiking up to the peak and back takes about 12-14 hrs. from Boquete or Volcan and it is recommended that you plan to camp for a night. Locals say that the most stunning vista is to be seen at dawn when the Pacific and the Atlantic are presented against the backdrop of a sun-drenched morning sky. Everything that you choose to do in the Chiriqui Highlands is a delight. Exploring by car, you will drive along a seemingly misty Alpine pasture and around the next curve, the banana plantation will remind you that you are actually in Panama and not Switzerland. Hiking trails abound for indigenous peoples have lived in these valleys long before roads ever existed. Numerous rivers provide the opportunity for rafting on thrilling Class III and Class IV rapids but my favorite pastime is to find a quiet spot on a nearby boulder. Birds stop for a drink in the quiet pools by the banks and water droplets catch rays of light, flashing glints of color in the sunshine. The air is cool and sweet and I am satisfied with the quiet adventures of the soul. Best Times to Go: For hiking, the "dry" season from January to April is best. It is never really dry in the Chiriqui Highlands, but rather, less wet. May to November is considered to be the rainy season and rivers become swollen giving rise to the Class IV rapids sought by intrepid rafters. Bird lovers will want to visit from February to May during the breeding season of the Quetzals, one of the most beautiful birds in the world. Getting There: From Costa Rica by car, the Chiriqui Highlands are just across the border. If you have the time, it is a very pleasant 7 hr. drive from the city of Panama to David through an interesting and varied terrain. Schedule another two hours from David to Boquete or Cerro Punta. Plan your trip so that you do not drive into the Chiriqui Highlands at night. You will not want to miss the most entrancing scenery in Panama. Buses are available but take longer and their schedules will require that you spend a night in David before traveling to the Highland areas. For those with limited time, it is easier to fly from the city of Panama to David where you can rent a car or make arrangements to be picked up at the airport. Clothing/Gear: Comfortable clothing, jacket, rainwear, umbrella, good walking shoes, compass, maps, first aid kit, bottled water and a Swiss Army knife. Additionally, for camping on the volcano, you will need to bring a tent, the usual camping equipment, fleece jacket and pants, windproof and waterproof shell and a flashlight. At 3475m (11,400 ft.), Volcan Baru can become quite cold especially in the wind and rain. General Information: Unless you plan to camp out for your entire trip, it is a hassle to lug camping equipment just to spend a night on the volcano. Another option is to hike up to the peak and arrange to be met there by a vehicle. The hike from Cerro Punta (about 6-7 hrs.) is shorter than from Boquete or Volcan (about 8 hrs.) so if you start early, it may be possible to reach the peak before the clouds obstruct the view. Rafting expeditions usually take place on weekends and require a minimum of four people. If you are traveling solo, it is a good idea to put in your reservations as soon as you arrive in Panama or before you leave home if your visit is short. Arrangements must be made in advance since the rafting outfitters do not have business offices in the Chiriqui area. All other bookings may be made with only a day's notice if you are traveling at whim except during holidays. Assuming double occupancy, plan on spending about $35-50 per person per day for a room and three meals. You may negotiate locally for a guide who charges about $10 per day. A guided hike up Volcan Baru or the Cerro Punta-Boquete trail with pick up at the end of the hike costs about $50 while a one day rafting trip costs about $100. Los Quetzales charges $5 per person for those wanting to visit La Amistad International Park through their property. The price includes a local guide who will accompany you for a few hours and you can purchase a picnic lunch at the hotel's restaurant to take with you. Do familiarize yourself with the birds of Panama. 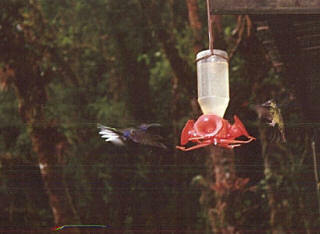 They are numerous in this area and many are classified as uncommon. The flight of the male quetzal with its extraordinary train is an awesome and unforgettable sight. A good map is essential. The "Sintesis Geografica" is published by the Ministry of Public Works and is available in bookstores. Cloudforest hiking can be quite demanding so pace yourself. Some paths are difficult to find and in remote areas so it is best to hire a guide. Do bring appropriate clothing. The Chiriqui Highlands can be cold and damp and on long walks, there is always the risk of hypothermia. Do be patient with the facilities and services available. While lowland Panamanians have always sought the invigorating weather of the highlands, international tourism is relatively new. Los Quetzales is an exquisite hideaway nestled within the boundaries of La Amistad International Park. It is an area of primary cloudforest that has been privately protected even before the establishment of Panamas national park reserves. Tours to the nearby areas are available but there is much to see and do right here. 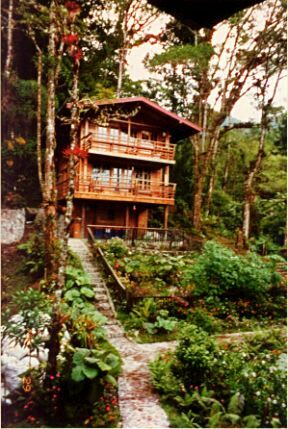 The cloudforest surrounds the cabins and its composition may be viewed from the privacy of your own balcony. Explore the forest with a guide for a few hours or for the whole day. Catch rainbow trout in a stream on the property and you won't have to worry about dinner that night. Laze on a bench and observe the many species of hummingbirds, the unusual yellow-thighed finches, and the resplendent quetzal, a daily visitor during the nesting season. Later, snuggle in your comforter as the embers in the fireplace slowly fade and the pitter-patter of rain on a tin roof lulls you gently to sleep. Los Quetzales will make all arrangements for guided hikes: Cerro Punta to Volcan Baru with pick up at the peak, Cerro Punta to Boquete with pick up in Boquete, and Cerro Punta to the high pass on the Cerro Punta-Boquete trail and back (half day). They will also make reservations for river rafting, horseback riding and visits to nearby hot springs. Panama by Scott Doggett is a Lonely Planet publication with a good description of the nature, culture and history of Panama. Getting to Know Panama by Michele Labrut is a general guide to Panama that is written from a local perspective. 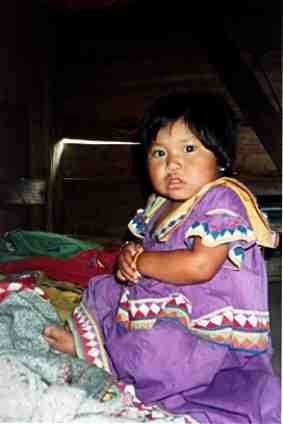 She provides excellent cultural and historical information about the Chiriqui Highlands. Backpacking in Central America by Tim Burford describes the delightful areas in Panama. The "Background Information" is superb and should be read prior to planning your adventure. He also describes detailed hikes from Boquete to Volcan Baru and down to Volcan as well as the Cerro Punta-Boquete trail. A Guide to the Birds of Panama by Robert S. Ridgely and illustrated by John A. Gwynne, Jr. This is recommended for avid ornithologists. There are few places in the world where a visitor is able to see so many different species of birds in a relatively small area.